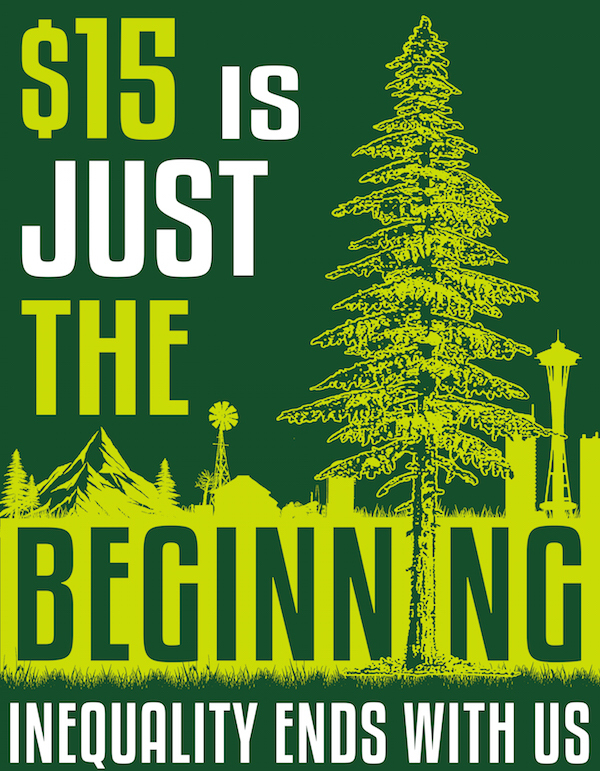 Workers in Spokane, Yakima, Pasco, Olympia, and beyond to rally, march & more — because "$15 is just the beginning. Inequality ends with us." On April 15th, well over a thousand fast food workers, homecare workers, retail workers, immigrant workers, drivers, adjunct professors, students, and others across Washington State will join tens of thousands more across the country in the biggest nationwide mobilization yet in the fight against poverty-wage jobs, culminating late afternoon in the streets of downtown Seattle. Homecare workers, fast food workers, students, and other supporters will rally for $15 and workers rights. Food service workers, immigrant workers, and other supporters will rally for $15 and workers rights at this fast food location. Airport workers and supporters will gather in Sea-Tac Arrivals Hall, then proceed to Alaska Airlines ticket counter to highlight health & safety issues and poverty wages. CULMINATING IN SEATTLE BECAUSE "$15 IS JUST THE BEGINNING. INEQUALITY ENDS WITH US"
4:00 pm: Seattle University (12th & Marion, Chapel of St Ignatius Reflecting Pool). Teach-in and more to send clear message: $15 is just the beginning. Inequality ends with us. Actions are being planned in Tacoma, Vancouver, Bellingham, Aberdeen, Bremerton, Port Orchard, Shelton, Everett, Ellensburg, and Moses Lake. Stay tuned for details in the days ahead. Job growth in Washington State has led the nation since voters passed the country's highest statewide minimum wage law in 1998. 69% of Olympia voters support a $15 citywide minimum wage, as do 63% of voters nationally, according to recent polls. The April 15th national day of action will include tens of thousands of workers across the country calling for $15/hour and workers rights for all.